Origin and Habitat: Euphorbia unispina occurs from Guinea and Mali east to southern Sudan. The largest area is the Jos Plateau (Bauchi Plateau) in Nigeria, south of Jos. Very abundant also in the region Bouake-Seguela in the Ivory Coast. Habitat and ecology: This species may occur in completely different bioclimatic zones ranging from humid forest to rocky hills and slopes in sub-arid savannah. It is locally common especially in granite and granodiorite inselbergs. Description: Euphorbia unispina is a stout, monoecious, candelabriform, cactus-like, shrub with a short thick stem, up to 3-3.5(-6) m tall, with 3-4 thick cylindrical branches and large thick fleshy erect leaves in a terminal rosette or tuft at the tips of the branches, naked below, or perhaps sometimes entirely leafless, spiny. The branches are covered by a thin silver-grey mantle of cork and by polygonal tubercles (podaria) arranged in spiral lines, more prominent near the apex. The green leaves are very variable even in one and the same specimen. The cyathia (flowers) are green. Stems: Branches cylindrical, up to 2-2.5 (or perhaps more) cm in diameter, silvery grey, covered with shallow tubercles with white latex. During the dry season the apex of the branches are covered with bud scales, which are thrown off when the new leaf rosette is developing. This is very unusual in succulents, as they usually have no bud scales. Spines: The spines are solitary, dark grey 3-12 mm long, absent from some parts, glabrous, stout, cone-shaped (not flattened at the base), but very abruptly dilated into convex suborbicular horny, light grey, shields round their base up to 1 cm in diameter, and inserted mid-point beyond the leaf stalk. Older E. unispina plants can be spineless. Leaves: Few arranged spirally in 4-5 ranks in a tuft at the tips of the branches, simple, soon falling. Stipules modified into 2 stout spines 6-10 mm long. Petiole short, thick. Blade fleshy, glabrous on both sides, pinnately veined, oblong to spoon-shaped, 5-12 cm long 1.5-5 cm broad at the apex, cuneate or linear cuneate, broadly rounded, almost entire to rather deeply 2-lobed, notched or fringed at the more or less dilated apex, gradually tapering into a sessile base, the margin narrowly crisped or frilled all round or entire, often wine-red. The leaves fall at the beginning of the dry season leaving a large leaf scar. Inflorescences (axillary cymes): Arising from the axils of the leaf-scars or spine-shields at the ends of branches, small about 12 mm or less in diameter, subsessile. Normally the cymes are composed of 1 to 3 short branches (mostly 2 ) each bearing a cyathium containing 1 female flower surrounded by two lateral (or many) male flowers. Peduncle short. Cyme branches mostly 2, short. Bracts 2 adpressed to the cyathium, about 2 mm long and as much or more in breadth, membranaceous, ovate, very obtuse, minutely denticulate. Flowers (cyathia): About 3-4 mm in diameter, with a shortly funnel-shaped involucre, green, 5-lobed with broadly ovate, fringed lobes, glands 5, elliptical, touching, red, each cyathium conaining 1 female flower surrounded by many male flowers. Flowers unisexual; male flowers sessile, perianth absent, stamen shortly exserted, red; female flowers with curved pedicel 4-8 mm long in fruit, perianth 5-lobed, ovary superior, 3-celled, glabrous. Styles 3, up to 1.5-2 mm long, slender, shortly united at base, then recurved-spreading, rather slender at the base, bifid at apex. Euphorbia unispina flowers at the end of the dry season, before new leaves are formed. Fruit (capsules): obtusely 3-lobed, about 6 mm in diameter, with the rounded lobes faintly keeled down the back, glabrous, far exserted on a curved and twisted pedicel 6-8 mm long, 3-seeded. 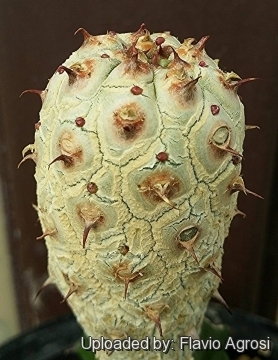 Related species: Plants of Euphorbia poissonii Pax having small spines resemble Euphorbia unispina closely. The two species cannot be differentiated at a distance of a few metres, but the former may be distinguished from E. unispina by the stouter flowering branches, with leaves in 8-10 ranks instead of 4-5, by the usually rudimentary spines, and by the numerous inflorescences densely clustered at the end of the shoots. 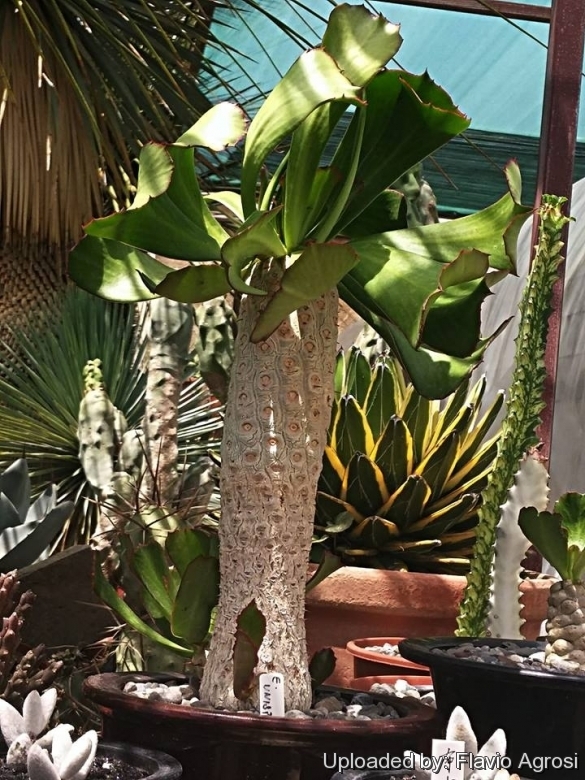 It is also similar to Euphorbia venenifica, that has spines flattened at the base, leaves different in form, less crisped on the margins and the styles shorter, more united and less slender. The taxonomy and distribution areas of Euphorbia unispina, Euphorbia poissonii and Euphorbia venenifica need to be reviewed as these species resemble each other closely. Euphorbia poissonii f. variegata hort. Euphorbia venenifica Trémaux ex Kotschy: Has a very poisonous latex, thorns simple not flat at the base without basal prickles. Distribution: Chad, Sudan and Ethiopia. 5) Burkill, H.M. “The useful plants of west tropical Africa”, Vol 2 1985. Cultivation and Propagation: Euphorbia unispina is a very slow growing and cold sensitive species can to grow in both pots and in the ground in areas with mild climate, but they can even be grown indoors. Soil. They grow well in a very draining mineral potting substrate. Water requirements. During the summer, they enjoy average feeding and watering. Hardiness: It is a cold sensitive species, however when dormant, plants are relatively cold tolerant. Propagation: Euphorbia unispina is easily propagated by stem cuttings; these should be at least 20 cm long, preferably cut at the base of a branch where the cut surface will be woody. After cutting they should be allowed to lie in a shaded place for at least 2 weeks for a callus to form on the cut end. Euphorbia unispina can also be grown from seed. Warning: When a plant get damaged it exudes a thick white milky sap known as latex. This latex (resin) is poisonous contains some of the most potent irritants known. The latex is particularly dangerous for the eyes, skin and mucous membranes. So pay extreme attention not to get any in your eyes or mouth. Cultivated plants must be handled carefully. Uses: The latex is caustic and vesicant. It is incorporated into arrow-poisons in Ivory Coast, Upper Volta, by the Fula in N Nigeria and in Kordofan. It is added to bait in traps and Tenda medicine-men place it on scarifications to thicken them. In Guinea, Mali and Ivory Coast medicine-men hold that the site of sleeping sickness is in the ganglia of the neck and ablation of them will effect a cure. They apply repeated dressings of the latex to achieve this. The latex is also used in Ivory Coast as a vesicant on areas of leprosy and the Yoruba name, leper’s oro, suggests a similar use in Nigeria. Vesicant action is due to the presence of triterpene derivatives. The plant is used by Tenda singers at rituals in the belief that it improves the voice, and mistletoe from it is held to repel and even to frustrate the actions of sorcerers. The latex is a powerful caustic, and its action seems to be solely as such for it is irritant to mucous membrances and in direct contact with tissue, but has no action on the heart, respiration or nervous system.